This is your idea of a career for your 20-something child – doctor, lawyer, engineer, teacher. This is their idea of a job – a flex-hours position doing something you’ve never heard of in some hipster-run company in California where every day is casual Friday, the vegan cafeteria is free, the CEO donates his salary to charity, and the best thinking is done on the employee basketball court. Can you see the problem here? Two fantasy worlds collide and your ideal is as unrealistic as theirs. When it comes to your adult child’s choice of college major or career field, you don’t have a vote, or even a clue. But you most likely will have to coach and prod, and endure the fall-out. • The choice of a college major or trade school is all theirs, even when you agree to share in the cost. Unless they are completely wasting their time and your money, don’t hold college tuition hostage to your idea of what they should do with their life. College is a time to explore options and follow dreams. Be patient and give your children room to either achieve those dreams or recognize a dead end. If the time comes when you can’t afford to subsidize those dreams, so be it. Your children can either find their own way or dream new dreams. • During these years of discovery, don’t make life too comfortable for your adult children. Financial stress is good for the soul. Make sure they know your limits as a contributing parent. My husband and I come from two different schools of thought. He is fond of telling me about the semester he lived on moose meat and fry bread because his parents had eight children and could not afford to subsidize them. My parents made it clear that as long as my grades were good and I worked when I could, they would pay what was necessary to get me through school – no moose meat in my kitchen. My head tells me my husband is right, but my heart still wants me to slip the children money under the table when he’s not looking. Find a balance that works for your family. • If you are concerned about your child’s college major, remember that he or she probably has no realistic idea of where it will take them after graduation. They’ve never been there before. Encourage them to pick up some extra classes with practical applications. If they’re majoring in exercise science (yes it’s a real field and all the rage among fitness-obsessed Millennials) drop hints that a minor in something like auto mechanics could give them a work option that would allow them to earn money to start that yoga studio. • Employers who hire this generation complain that they bring to the job a sense of entitlement and a loose work ethic. 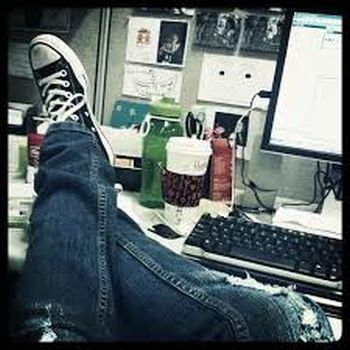 They are unprepared for long days, short vacations and inflexible bosses. Talk to them about common workplace expectations. If your child has an independent spirit (“I can’t imagine myself ever working for someone else.”) brainstorm with them about careers that will allow them to chart their own course. • It is likely they won’t know how to find a job once they have diploma in hand. This is nothing like filling out the application at Target. Be ready to help them (or find help for them) as they craft a resume and prepare for interviews in the big leagues. They should take the lead in this job search, but they still need your wisdom and confidence to navigate it. • Their world of unemployment is not the same as your experience 20 years ago. Their job search will be high-tech and will include options you have never heard of. See this past blog post, “Us Vs. Them” for a reminder of how your world differs from theirs. • Beware the notorious “gap year” after college graduation, or the lethargic graduate who takes up residence on your sofa. If your child is not aggressively looking for a career job, and not working at all in the meantime, it may be necessary to pull the plug. Nothing motivates like hunger and homelessness. • As your adult child makes mature choices about a college major or scores a great job, resist the urge to take credit, even if it was your idea. Don’t say “I told you so,” either in word or demeanor. This is their victory, don’t deprive them of credit for making smart choices.